In the weightlessness of outer space, beverages are served in plastic pouches. Any liquid that escapes from a container floats away. Because of surface tension, floating water forms perfectly spherical drops and blobs. 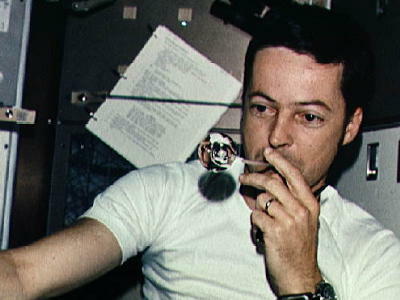 Astronaut Joseph Kerwin, aboard Skylab 2 in 1973, forms a perfect sphere of water by blowing droplets from a straw. Photo courtesy of NASA. You can observe such spherical drops in the following weightlessness experiment. Allow the water to slowly squirt out of the puncture hole. Point the stream of water straight up. Closely observe what happens to the water stream. You should see that the water breaks up into tiny spherical droplets. 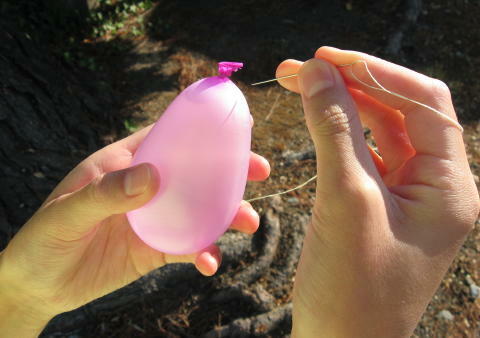 The water is totally weightless from the time it leave the balloon until it falls down and hits something. The water forms spherical droplets under these conditions, just like the water balls in outer space. Starting in the 18th century, ammunition makers used this principle to produce perfectly spherical lead balls, called lead shot, to be used in shotguns. 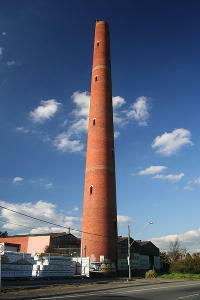 They built 100-foot-tall towers, called shot towers. From the top of a tower, molten lead was dribbled down at a controlled rate. The weightless drops of molten lead formed spherical drops as they fell. The balls solidified as they fell the full length of the tower. At the bottom of the tower, the round balls of lead landed in a container of water. Scientists today use similar tall towers, called drop towers, to test equipment to be used in outer space under weightless conditions. They put the equipment in a box and the box is allowed to drop for a few seconds, during which the equipment is tested. At the bottom of the tower, the box lands in an air bag or some fluffy material to cushion the fall so that the equipment is not destroyed on impact. Some amusement park drop towers offer guests a couple of seconds of weightlessness as the seats fall freely. Free-fall skydivers experience weightlessness when they jump out of an airplane. However, after a few seconds, wind resistance becomes so strong that the jumper cannot accelerate any further. The final speed at which the jumper falls is called the terminal velocity, about 100 miles per hour. The jumper is "held up" by the strong wind and is no longer weightless.